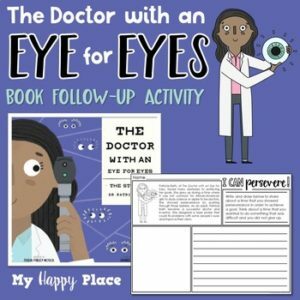 This follow-up activity to Julia Finley Mosca’s The Doctor with an Eye for Eyes: The Story of Dr. Patricia Bath, allows students to reflect on the life of Patricia Bath while making text-to-self connections. With the included worksheet, students draw and write about a time that they showed perseverance. This activity is best completed after a class discussion about Dr. Bath and the obstacles she faced growing up and entering into her career. The worksheet is included with two different line styles/sizes. Choose the page that will work best for your students. Additional lined pages are included if you wish to have children write more than will fit on the worksheet. The Doctor with an Eye for Eyes: The Story of Dr. Patricia Bath Is a picture book biography of Dr. Patricia Bath. The illustrations that accompany the rhyming text support the story and add details to enhance understanding. The book also includes additional biographical information for teachers at the end, as well as a timeline of Patricia Bath’s life. Book images created by Daniel Rieley are used with permission from The Innovation Press. Click here to see more resources to support books from The Innovation Press.